Martin Luther King, Jr: I have a dream, and a "Letter"
And today is also a good day to read (or re-read) King's great essay, Letter from Birmingham Jail. Bruce Springsteen sang this song with some friends in Washington, DC yesterday. In the clip below, he performedit in LA in 1985. Lori Sellner had great seats at the Democratic National Convention in Boston in 2004, and she remembers what went through her mind during the keynote address. It was a thought she mostly kept to herself because it seemed pretty far-fetched to anyone who wasn’t there to experience the way people reacted to the young state senator from Illinois. “It was pretty much when I felt I’d heard a future president speaking,” Sellner recalled last summer. A Sleepy Eye resident and one of southern Minnesota’s most dedicated Democratic volunteers, Sellner said she knew that night in Boston she would be one of Barack Obama’s volunteers if he decided to run for president some day. But Sellner was careful not to publicize her prediction back then. “I didn’t share that with a lot of people,” she said. “But it’s something I’ve had in my heart in terms of the hope of it happening someday.” . . .
. . . When Obama announced he was running for president, Sellner — the chairwoman of the 1st District DFL Party — worked hard to get him elected. On Tuesday, she will be at the inauguration, listening to Obama speak again — as president of the United States. . . .
Walz reserved some [tickets] for his family, with the bulk being distributed by lottery. Walz’s wife, Gwen, will attend, but their young children — Hope and Gus — are not because of the logistical issues, long waits and sub-freezing temperatures predicted for Tuesday morning, [District Director Meredith] Salsbery said. For those same reasons, Salsbery said she decided not to claim one of the seats. . . .
Walz wasn’t concerned about the cold and figured a lot of Minnesotans, after the bone-chilling weather of the last week, would consider sunny and 30 degrees to be an afternoon at the beach. “That may have as much to do with (ticket demand) as President-elect Obama,” Walz joked. But the second-term congressman, who was one of the first in the Minnesota delegation to endorse Obama, was glad to see the intense demand for tickets and the excitement about the beginning of a new era in American politics. It’s also a monumental logistical challenge for Washington, D.C. That was in evidence as Walz looked out over the Capitol Mall last week. “I have never seen so many porta-toilets in my life,” Walz said. There's more in the article; go read the whole thing. Also this week, it appears as though Walz wants to remain poor and even force every other member of Congress to live in poverty! I understand, Representative Walz, that YOU are used to living like a pauper given your background as a teacher but what about these other members will be unable to survive on less than $174,000? Phoenix Woman notes that We Almost Had TARP Oversight. That is the slogan the Highway 14 Partnership hopes to hammer into the legislature’s collective conscience this year, to push through refurbishing what is known to many Minnesotans as the deadliest highway in the state. “It is with the idea when the legislature hears ‘fix it now,’ they will know we are talking about Highway 14,” said J.D. Burton, an attorney with the law firm Flaherty & Hood P.A. which represents the Highway 14 Partnership. The U.S. Highway 14 Partnership held its annual meeting in Owatonna on Friday. The partnership is made up of counties and cities throughout southern Minnesota, including Owatonna and Steele County. It was formed to monitor and lobby state legislatures in an effort to expand what used to be a two-lane highway across the southern portion of the state into a safer, four-lane roadway. Read the whole article at the OPP. It's sister paper in Waseca, the County News, asks In the market for an ethanol plant? If so, now bankrupt Vera Sun is having an auction. The Owatonna People's Press also reports a moving--though not partisan or political--tale of a WWII soldier's effects coming home to Steele County in The lost soldier: Dog tags of a WWII vet find their way home and Preserving history: Welcoming a soldier’s effects home. William Sauter, a Marine, was lost when his plane went down off the Solomon Islands. Photo: There's no secret weapon for DFL victories in Southern Minnesota, just a whole lot of grassroots organizing led by dedicated volunteers like First District chair Lori Sellner. Photo by Laura Askelin (who's usually pretty busy herself). District papers are running stories of those heading to Washington for Tuesday's inauguration festivities. We are envious of those going, but didn't ask for or seek a ticket ourselves. When it came time to decide whether to make the trip to the nation's capital for the inauguration, Sellner waited until the last minute. She said a friend of hers convinced her to go. "This is something that will be historical and a once-in-a-lifetime opportunity, and I decided I wasn't going to pass up the chance," she said. Sellner received her ticket through the national Democratic Party office. The opportunity to attend the inauguration is one extended to all national party delegates. Sellner was a Minnesota delegate to the Democratic National Convention in Denver this past summer. Sellner will fly to Philadelphia on Monday and take a train into Washington for the ceremony. She has no idea yet as to where she will be sitting for the event. Because she does not expect to be able to see the inaugural parade, her VCR at home is programmed to record broadcasts of the entire day. Sellner is also going to a Minnesota DFL function at the American Legion at the U.S. capitol. She expects the Minnesota Congressional delegation may attend the event, along with party activists. Did our usual last-minute packing job last night. Got up early to shovel snow because it got above zero finally! Ellen's holding one of many Obama pins. We got this one in 2006 when we saw him in Rochester campaigning for tim walz and amy klobuchar. If you can't see, it says "Barack Obama for president. Coming Soon!". Who would have thought? Go over to 2009BOIE to see the button and read David's entertaining posts. When Barack Obama is sworn in as the nation's first black president on Tuesday, George Thompson of Rochester plans to be there, one person amid a jostling mass of humanity. But not everyone will have Thompson's vantage. His personal perspective on the presidential inauguration will be as someone who has seen within his own lifetime just how far America has come. Many people have read that history; Thompson has lived it. Thompson was raised in a world of segregated drinking fountains, bathrooms and public accommodations. As an 11-year-old boy living in St. Louis, his father told him how to avoid getting maimed or killed before taking a trip to Mississippi. If you're walking down a sidewalk and you see a white person coming, step off the sidewalk. Don't look them in the eye. . . . Truth be told, Thompson didn't intend to attend the inauguration at first. Thompson, a board member of the St. Paul Foundation and former chairman of the Blandin Foundation board of trustees, planned to watch it at home, relaxing. But his son, George Jr., a minister and highly persuasive individual, began a long-distance campaign from his Los Angeles home to convince his dad that they had to attend the inauguration together. "He's kind of like, 'We've got to be part of this monumental change.' He said, 'Barack is not going to be able to fix things all by himself,'" Thompson recalled, chuckling at this son's insistence. The biggest obstacle was getting inaugural tickets. It was a sign of his son's persuasiveness that he soon had Thompson beating the bushes for them. Thompson sent out some notes. Soon afterward, Congressman Tim Walz's office called back with news that it had two tickets for the father and son. Despite the anticipated hassles, Thompson said, he is looking forward to the "phenomenal" event. It will signify, from the perspective of one man's life, just how far America has traveled. "I've seen it. I've witnessed it. I've been a part of it," Thompson said. We met George Thompson at one of Congressman Walz's economic summits, when the outgoing Rochester leader introducing himself to us when we were standing next to him in a lunch line. An interesting person indeed. . . .The two are taking a 1,000-mile, day-long journey by car so they can be present at the swearing-in ceremony of President-elect Barack Obama. Bland, who is African-American, says watching the inauguration on TV is not enough. He wants his daughter, who is biracial, to witness in person how the country has changed, that she can be anybody she wants to be. It helps that Bland's own biography is rooted in the Washington, D.C., area. He was born and raised there until he moved to Rochester in the late 1980s to play football and attend college. The move was a culture shock for Bland, who went from never having played against a white player on the gridiron to being the only black person on the field.. . . When Sunset Terrace Elementary students watch Barack Obama's inauguration on Tuesday, becoming the nation's first black president, principal Jody Goldstein won't be anywhere near them. Maybe they'll spot her on TV. Goldstein will be in Washington, D.C., with her husband, Raymond, who serves as president of the International United Synagogue of Conservative Judaism. Raymond Goldstein was sent an invitation for the pair. "We kind of sat back and said, 'Is this real?'" Jody Goldstein said. "It's a once in a lifetime deal." John Bulcock and Nadeem Noor Mohammed, both employed at MSU, are planning to go to Washington D.C. for the Obama inauguration. . . .
. . .Bulcock — the assistant director for student activities at Minnesota State University who advises the university’s fraternities and sororities — is among the more than 200,000 people with tickets to the inauguration. Another million (or 2 million or 3 million) are just planning on showing up to be there when history is made. “It’s a once-in-a-lifetime opportunity, I think,” he said. Nadeem Noor Mohammed also is going. He plans to road trip it with a couple of buddies, which will be his first time in confined quarters with the same people for 12 or 13 hours. Unlike Bulcock (who requested tickets from Walz’s office days after the election), Mohammed is going without tickets. He’ll be among the huddled masses — or perhaps cheering or roaring masses — descending upon D.C. to be part of it all. Mohammed, born in India, is the building coordinator for MSU’s Centennial Student Union. He’s also a self-described news junkie — “I’ve always been interested in current events”— and follows especially closely any news story dealing with foreign policy. Both men will be calling campus on Tuesday, where a major inauguration watching event is being planned. Interest is reported to be high. A few days after Sen. Amy Klobuchar invited Minnesotans to her office for Spam puffs and potica, U.S. Rep. Tim Walz and his wife announced he'd open his office to folks visiting DC for the inauguration. Walz promises "light refreshments and hot beverages will be served." No word on whether those refreshments would include spiced pork products. Spam with mayo would be in order given the importance of both in the First. Photo: Workers build inauguration viewing stands in front of the White House(top); Senator Obama campaigning in Rochester for Klobuchar and Walz (bottom). (Washington, D.C.) – Congressman Tim Walz will host an open house on Tuesday at his office in Washington for southern Minnesotans traveling to see the inauguration of President-elect Barack Obama. Congressman Walz and Gwen Walz will be on hand to greet Minnesotans and welcome them to our nation’s capital for this historic event. Light refreshments and hot beverages will be served. For a more complete list of Minnesota receptions, please visit http://walz.house.gov/. Since the election, we've been writing about the effect of progressive grassroots organizing in Southern Minnesota on the ballot box in posts like Progressive Movement in Rochester recognized by Take Action Minnesota. One reason Minnesota DFLers have made big gains in recent years is that they've gotten very, very good at organizing. Those grassroots skills, honed for campaigns, may have proven critical when the recount rolled around. It's an aspect of this endless story that bears more reporting. Conservatives have been paying attention to the consequences of good organizing on ground that they once held. A couple of weeks ago, we noticed some viral promotion in newspaper comments sections, for an activist training day on Saturday in Austin. Are you tired of local and state governments spending like crazy and taxing us to death? If you are concerned and want to learn how to hold these people accountable CAGWH and American Majority are holding a free activist training class next weekend(saturday) at the Austin Library. This class will be at 1pm and lasts about 2 1/2 hours. Please email Joel at info@cagwh.com if you are interested in attending. Joel, contact person at CAGWH, the acronym for Citizens Against the Global Warming Hoax, is a busy viral bee. We've seen this notice posted in online edition comment sections of papers, including that accompanying a John Adams letter to the Post Bulletin, Don't fall for myth of 'green' energy. The workshop is duly noted at web sites for CAGWH and American Majority, though the latter organization's post about the event doesn't note its co-sponsor. There's not a lot of transparency at the CAGWH web site (a whois search reveals that the domain name is registered via a proxy) so we don't know what this group is, though American Majority isn't particularly secretive, spelling out basic organizational information in its "Who We Are" section. More on this in a bit. Please join American Majority Minnesota on Saturday, January 10 for an opportunity to make a difference in your community by learning about new tools and resources and by networking with other like-minded individuals and organizations. The training will be hosted at Austin Public Library located at 323 4th Ave NE in Austin, MN from 1:00 PM until approximately 3:00 PM. The event is FREE and is open to the public and all attendees will receive a complimentary take-home booklet. Come enjoy a full day of great new information and become a part of Minnesota's rich history of individuals making a difference! Since American Majority is a "a 501(c)(3) registered non-profit" headquartered in Purcellville, Virginia, the training doesn't specify what "like-minded" means. To learn that, read below the fold. Will Republican leadership fight for the title in a grudge match? "This is going to cost billions of dollars, and in my mind we need to have a cost-benefit analysis," House Minority Leader Marty Seifert, R-Marshall, said recently at the Rochester Area Chamber of Commerce's legislative preview. "I don't mean to throw cold water on the parade, but who is going to pay the bill for this?" "We need to do it. We certainly need a statewide plan," House Minority Leader Dave Senjem, R-Rochester, said at the chamber's legislative preview. Looks like the copy editor at the PB miss this one: the genial, Rochester-based Senjem is the Minnesota Senate Minority leader. Or perhaps the remaining Republicans in the Minnesota legislature have concocted a new way to enlarge their numbers via a daring new cross-chamber pollination system. Photo: In a dramatic new move to bring Minnesotans back to the Republican Party, Governor Pawlenty (center) announces the grudge match between Marty "The Comb" Seifert (left) and Dave "Dimples" Senjem (right) for the title of Minnesota House Minority Leader at the Moose Lodge in Imogene, MN, on Sunday! Sunday! Sunday! Looking for your polling place? Use the nifty polling place finder online, courtesy of the Minnesota Secretary of State's office. Polls in Minnesota open at 7 a.m. and close at 8 p.m.
(Mankato , MN ) – On Monday, November 3, Congressman Tim Walz will be barnstorming southern Minnesota with a series of Get-Out-The-Vote rallies and Main Street Stops with local residents all across southern Minnesota. Throughout the day, Walz will be traveling to New Ulm, Mankato , Rochester , Albert Lea , St. Peter, and back to Mankato, where he will visit with campaign volunteers and stop at stores to meet with local residents. A complete schedule for Monday is below. Congressman Tim Walz holds a Get-Out-The-Vote rally with students at Minnesota State University-Mankato. ‘ Midnight Madness’ volunteers will be preparing for literature drops around the area. Instead of a speech, Mondale and Congressman Tim Walz spent Saturday just speaking individually to voters and eating hamburger steaks at The Kitchen. It was part of a tour around southern Minnesota to energize voters about getting out the vote. “The case is pretty well made,” he said. “We think we’ve made a strong case to them and now we’re just into executing the get-out-the-vote effort.” . . .
. . .As a newcomer to the world of politics, Walz earned 46 percent of the Steele County vote compared to the 53 percent garnered by his Republican opponent Gil Gutknecht, the incumbent who Walz managed to unseat. But in his first term, Walz described Owatonna as pragmatic, with voters wanting to see effectiveness. He considers the city as a “solid, middle-of-America middle-class town” and believes he can have a better showing here. 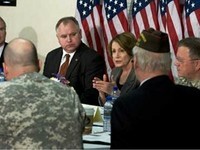 “We want to give them a good look and let them know where we stand,” Walz said. Walz was also campaigning in Republican Dodge County yesterday, as well as Mankato and Rochester. His campaign stops contrast with those Davis has chosen, which seem to be aimed at shoring up the GOP base. Walz's schedule for today, which includes another stop in Owatonna, is here. Brian Davis was hitting his base in Pipestone, Martin and Brown Counties, with a stab at Nobles County, the New Ulm Journal reports in Davis on the road. He does his usual denial about the down side of privatizating Social Security, while backing away from his earlier, extended flirtation with the national sales tax. Davis would still like voters to believe that the issue only came up once, but BSP readers learned better in our post Brian Davis and Minnesota's flat tax organizers. Asked about the record third quarter profits ($14.8 billion) that Exxon reported this week, Davis said he thinks the investment tax credits oil companies received for drilling should end. But there should be incentives to encourage oil companies to go after the large amounts of U.S. oil that exists in oil shale. He also favors a John McCain style of tax credit that can be used to purchase health insurance that goes from job to job, rather than expecting employers to provide health coverage. What does Brian Davis want at this point, other than to get elected? We looked at his one-man head-on policy collision over earmarks yesterday in Davis makes sudden lane change on federal earmarks. In other news, we don't care whose signs a visiting prof in Northfield stole, this guy's just quite simply a blinking *hole. It's possibly even worse than the Waseca man accused of mowing down neighbor’s corn field back in July. A guest at a neighbor's party, he mowed an acre. Wags in the Waseca County News comment section suggest that anybody who mows corn has to be plowed, though at least he wasn't stalking anyone. One wiseacre thinks the perp must have been drinking Grain Belt. The property damage to the corn was greater than that of the signs--on the other hand, stealing a person's right to political expression dampens democracy. All puns aside, we hope the farmer recovers the lost income and Rice County throws the book at the sign stealer. 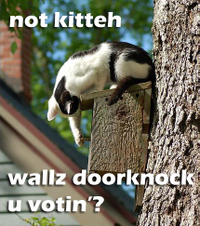 Photo: If our selfish feline friend can do his bit, you can help get out the vote, too. Volunteer via the DFL or your local candidate. Sign up to help Walz here. ( Mankato , MN ) – On Sunday, November 2, Congressman Tim Walz will be barnstorming southern Minnesota with a series of Get-Out-The-Vote rallies and Main Street Stops with local residents all across southern Minnesota. Throughout the day, Walz will be traveling to Winona , La Crescent , Wabasha and Owatonna , where he will visit with campaign volunteers and stop at stores to meet with local residents. A complete schedule for Sunday is below. Mmmm....pancakes. Wouldn't that be tasty and expeditious? Al Franken is coming to Rochester on his "For the Middle Class, For A Change" Tour with a few of his friends, Congressman Tim Walz and Senator Taryl Clark– And we want you to be there. Join Al & Tim on Thursday the 30th from 9:00-10:15 am at the Masonic Lodge in Rochester for a free Get-Out-The-Vote pancake breakfast. They will be talking about the change that Al will bring to Washington and how he will be a partner with Congressman Walz. And, we'll be letting you know about opportunities to help elect Barack Obama, and the entire DFL ticket. So join us on Thursday the 30th and don't forget to bring an undecided friend. The Masonic Lodge is located at 2002 2nd St. SW in Rochester. If you can make it or if you have any questions, please let Chelsie know by emailing cglaubitz@gmail.com or calling 507.382.9879.